A super easy and quick tofu recipe, great for throwing together for a weeknight dinner and serving aside some Asian noodles or rice and veggies. The recipe only uses five ingredients (tofu included), many of which you probably already have in your cupboard. 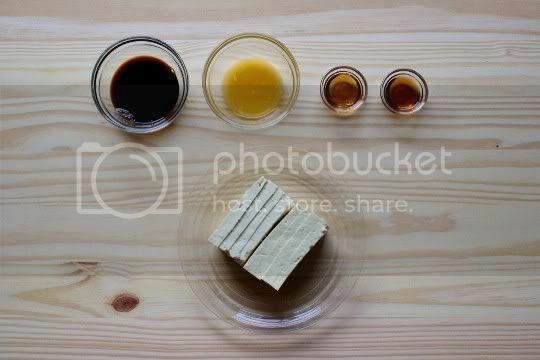 Simply whisk together soy sauce, orange juice, sesame oil, and maple syrup for the sauce, and slice up some extra-firm tofu. 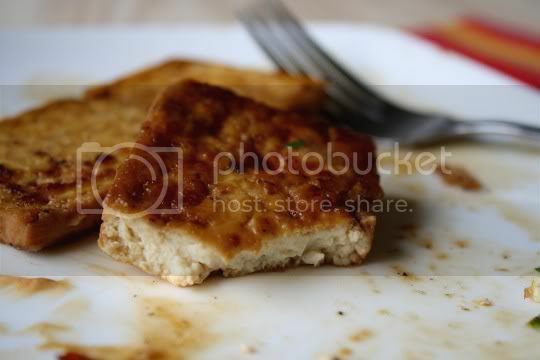 Fry the tofu slices (or cubes, whatever you decide) until they're crispy and golden brown on each side. The recipe suggests 5-7 minutes on each side, but I'd say go closer to maybe 10...depending on your flame heat of course. But you really want to get these nice and crispy, I'll explain why later. Once they've reached perfect fried-ness, pour the sauce in the pan and cook until the tofu is coated and glazed and the sauce thickens. Or at least, this is what the recipe says. My sauce really didn't thicken at all (although it did reduce), but this is the perfect kind of sauce you'd want to add some cornstarch to for the perfect consistency. And then you're done! 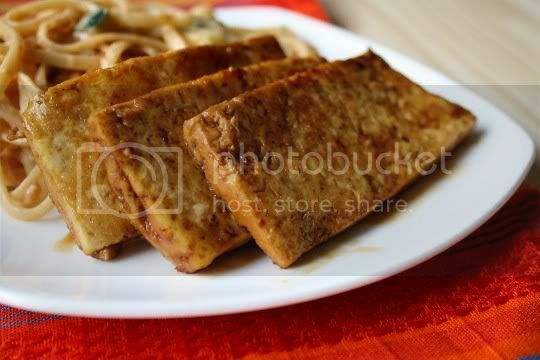 The tofu is crisp and chewy on the outside, with that soft tofu texture on the inside (which by now, of course, has soaked up all that delicious sauce). And the sauce, mm mm mm. It's tangy, salty, and sweet, with a light roasted flavor from the sesame oil, yet there's really only a hint of orange flavor. Another unfortunate issue with this recipe is that there wasn't really any "lacquering" going on. I think this may have had to do with the fact that my tofu wasn't completely crisped up and fried to the perfect texture. As a result, the sauce (which didn't thicken) acted more like a marinade and just soaked through. I was expecting my tofu to be shiny and glazed, coated in a thick and sticky sauce...but it was more like a thin pan sauce, which was still good for drizzling. And there will be extra, which you'll DEFINITELY want to use up. Make again? Yes. It's a simple, quick, few-ingredient recipe that yields good results (with the suggestions made above anyway). I'd definitely want to experiment with some other meat substitutes too.